It's been a rough road down for Koios Beverage as the pot infused stock market euphoria crashed and burned over the last month and a half. With shares down a staggering 61.9% from top to bottom, it appears that with the dust finally settling, shareholders are again picking away at cheaper stock prices. If shares of KBEV manage to break above one last key resistance level ($0.53), there's a good chance that this bottom picking may turn into an outright bullish rally in the short-term. While we’ve highlighted the static resistance area at $0.53 as the technical catalyst for a breakout, the stock is already showing bullish signals. Firstly, it was able to hold above it 200 day moving average (dma) and in today’s trade closed above its 50 dma. Also, volume is back on the upswing. Volume is typically a precursor to price movement, so we want to see this metric continuing to increase on bullish days. Overall, a break above $0.53 should see the bulls in control over the short-term, however there are areas of resistance to take note of, primarily around the $0.66 level followed by more at $0.85 with more at the September high at $1.05. For this trade, we would be looking for a price target at $0.66. As for support, we would look for the $0.50 level to act as near-term support (not shown on chart) as this appears to be not only the 50 dma but also a minor static support level. Below that, support would also likely appear at $0.40 - $0.43 and $0.33 - $0.36. 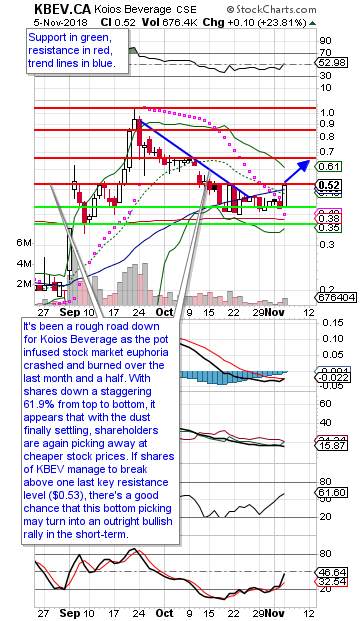 We find the $0.50 level to be important support, so would be placing a stop loss at $0.49. The trade strategy is quite simple, we would only act on a stock entry should the stock close above $0.53, specifically on strong volume. Based on a $0.53 entry level, our upside potential looks to be 24.5% while our downside risk is limited to 7.5%.